Parents the world over are constantly reminded of one thing – think of the children. Whether that be in terms of simple every day actions, or the long term vision in which we have to help save the world, generation after generation are told to consistently think of others. Especially the children. Now though that same train of thought is being brought to the videogames scene, and with Think of the Children, you’ll be left to harness all of your parenting skills to ensure that the little blighters that both light up and destroy your life in one foul swoop are kept safe. All with a huge degree of humour thrown in. Think of the Children is set up over the course of 12 stages, each of which brings something just a little different to the table. With an overruling court-based story arc overseeing the whole thing, pushing a humorous narrative whilst seamlessly segueing each level into the next, there are many things to like about Think of the Children. But at the end of the day, it falls short of being great due to a number of niggles. 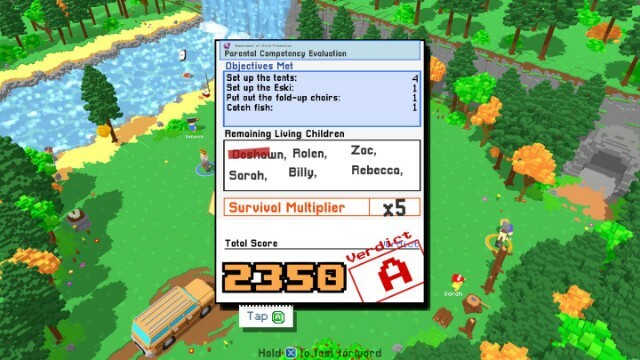 Your task with this delightful little parenting simulator is to keep your brood of children safe from all danger. This is easily done and after taking in a slightly skewed top down angle, you’ll be left to dash from pillar to post, grabbing kids with one trigger, and shouting at them for distraction purposes with the other, before focusing your attention on the next child in line of danger. The action is fast, the action is hectic and for pretty much two minutes at a time, the action is non-stop. A very simple tutorial sets you up with the highly basic controls, but from there on out you’ll be left to squirt through some rather short and sharp stages. These see you going to the park and ensuring that your kids don’t fall off the swings, don’t play with the BBQ or are able to keep away from the road – because if they don’t it won’t be long before a car comes along to squish them. From there you are taken to a decent variety of stages, like the zoo, the beach, and to the airport, all of which come with their own unique dangers and obstacles that need overcoming. Further to that though and as the narrative kicks up a gear and moves into the weird and wonderful, you’ll also find you and your family falling from a plane, or scuba diving underwater – jet packs and air tanks are essential here. For all the variety though, each stage really does play out like the one before it, and the one coming right up, in that you just need to scoot around, grabbing kids and pushing them out of danger for a few seconds, attempting to last a set amount of time, or trying to avoid too much embarrassment in order to see each stage ranked. 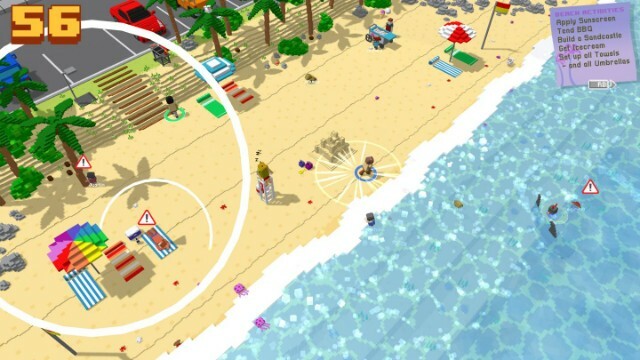 Objectives need to be hit too and for instance, in the first level where the BBQs need tending to, you’ll need to flip burgers to help increase your score by pounding the A button; other levels will have you mingling with guests at a party or taking selfies at the zoo as extra point scoring opportunities. You see, the problem is, for each death of a child (and believe me, there will be catastrophes taking place no matter how good a parent you think you are), your score diminishes and you’ll struggle to meet the required C- score needed to allow you to advance to the next stage. This all comes across as pretty tough in the first instance, particularly if you are a lone player, but the more you play Think of the Children, the more you will quickly understand the need for swiftness in your actions – sitting back for even a second will be the difference between quite literal life or death. Dragging in some mates for local cooperative play also helps immensely and should you be left scratching your head at how you are ever going to be able to reach the scores required as a solo player, once you get another few adult members alongside you, it makes it much easier to save those pesky kids… if only because the size of the levels put massive restrictions on the single parent. That is until the final stage, and whilst I won’t ruin the tale, this sees the standard quick fire levels displaced by a longer, lengthier, altogether harder multi-screen affair. Even with multiple players to hand, it’s a tough old ask to be able to complete the final throes of Think of the Children, negating all the good that has been done in the stages previous to it. In fact, it leaves a bit of a sour taste in the mouth. 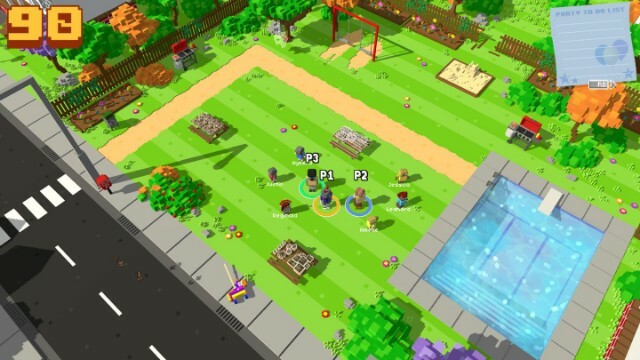 That aside, the multiplayer madness found in Think of the Children is good and the combination of boxy voxel visuals and a rather delightful, hugely catchy soundtrack mixes with the fast paced gameplay really well. The menus may be super clunky, there may times when it all goes wrong, and the sensitivity found in the trigger actions occasionally sees a bit of frustration creep in, but for the most part it’s a fun, laugh out loud playthrough that will appeal to any groups who wish to waste an evening. It’s not bad in the replayability stakes either as each time you complete a level you’ll earn skin unlocks which in turn allow you to create and customise your very own characters. Yes these aren’t essential, and you’ll no doubt struggle to find the enthusiasm to unlock everything, but it’s a nice little touch to see included. If you have always wanted to prove your parenting skills once and for all, then, to a certain extent, Think of the Children lets you do just that. Just be aware that it only really works in cooperative form so single parents will need to call on the help of friends and family. Just like in real life. Next articleEGX 2019 returns to London!